Starting with the weapon oaded and cocked the actiqp is as follows: The trigger being pressed, the trigger bar disengages from the sear block and allows the striker to be driven forward by the spring in the bolt to fire the cartridge. As the bul et goes down the barrel the recoil drives back against the base of the cartridge base which transmits the blow to the bolt face thereby starting the locked recoH action and barrel to the rear. The barrel, barrel extension and bolt recoil, locked together, about % of an inch. For the first half of this travel, during the period of high breech pressure, they are securely locked together, and then the front projections of the lock frame (which are set against the sides of the pin passing through the barrel extension and the breech block) force the breech block pin down, drawing the breech block down out of its locking slot on the under side of the breech block. The bolt is thus released from the barrel extension and so can continue straight to the rear. As the barrel extension itself travels to the rear, the barrel plunger spring is compressed and the rear of the barre! extension drives the claws of the accelerator back sharply, flipping the accelerator up and backwards on its pin. As the accelerator turns, the tips of its claws strike bottom projections on the bolt and thus accelerate the rearward motion of the bolt by transmitting to it the thrust absorbed from the barrel extension, which is now bed in rearward position locked to the frame spacer slots. Speeding the rearward motion of the bolt at the same time that the barrel is slowing up, permits the empty case to be extracted from the chamber without the sudden tug that would normally occur. (This makes special lubrication unnecessary). The accelerator claws while engaging the shoulder of the T lug firmly lock the barrel extension in the rearward position to the lock frame. A stop prevents the accelerator" from going backwards too far and the barre. plunger spring is held compressed. During baclcward motion of the bolt, the driving spring is compressed over the driving spring rod whose head is held securely in the back plate of the receiver. The extractor fitting over the top front of the bolt draws a loaded cartridge from the belt at the same time that the T slot machined into the face of the bolt draws the empty cartridge case from the firing chamber. The extractor cam plunger (which rides along the top of the extractor cam and the extractor feed cam) is finally forced in by the beveled section of the extractor feed cam. The cover extractor cam thus forces the extractor down and the p unger spring out behind the extractor feed cam. During the backward movement of the bolt, a stud on the beit feed lever (which is mounted in the front of the cover on a pivot) moves to the right in the cam groove cut in the top of the bolt. Thus the belt feed slide which is attached to the ever is moved to the left. 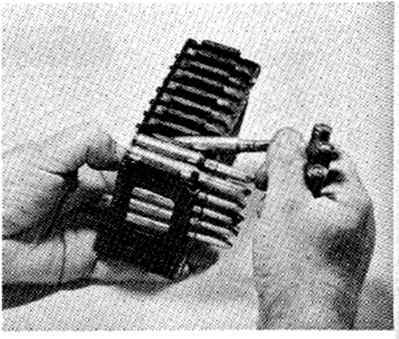 The belt feed pawl (located on the under side of the cover above the bolt) springs over the left of the first cartridge (which is being held in position by the belt holding pawl below the be t on the .eft side of the feed block) and supports the cartridge and the belt to prevent feeding trouble. How a machine gun bolt works? How the browning machine gun works?